A Quiet Space in Provence, a photo by makingamark2 on Flickr. Instead of going down to Bedoin to the hotel to post to the blog I did this sketch instead. Plus I've got this thing about sketching the colour and tones in walls. This was my choice from the Menu du Chef at the Hotel Crillon Le Brave where we went for Robyn's "treat" meal before she goes home. The Menu du Chef is available at lunchtime. This is a link to a sample menu available in the evening. 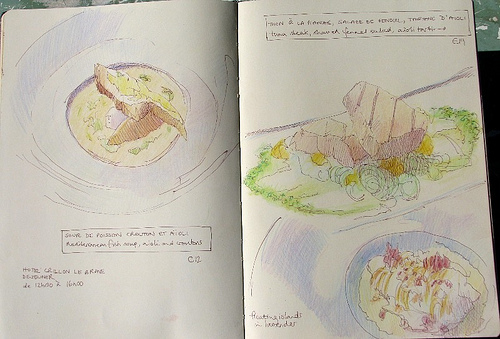 There's another sketch to come which I did of the view from the terrace after drawing this meal. This is my first post since the massive thunderstorm which blew out the modem in the house at Couguieux and burned out the switching box. Sarah says she's now had a fireball in her room as well as scorpions! Meanwhile I just have a cat who sleeps on my bed on all day and wants lots of loving when I get into bed at night. On Sunday we went to see the Sunday Markets at L'Isle la Sorgue. They have two each Sunday - a brocante (antiques) market and a normal market selling all the sorts of things you see in provencal markets. I was first introduced to these when I came painting in Provence with Arts in Provence some 20 odd years ago; The emphasis is on getting there early or facing a long walk from where you park your car as they are extremely popular - as is lunch at the very many restaurants before driving home. Ruth Phillip's tells us in her new book Cherries from Chauvet's Orchard, that the brocante market is the source of some of the still life objects seen in Julian Merrow Smith's blog Postcards from Provence. You can see photographs of the market on my Making A Mark blog - see L'Isle sur la Sorgue Markets and I'll be posting more in my Provence set on Flickr when I get home. 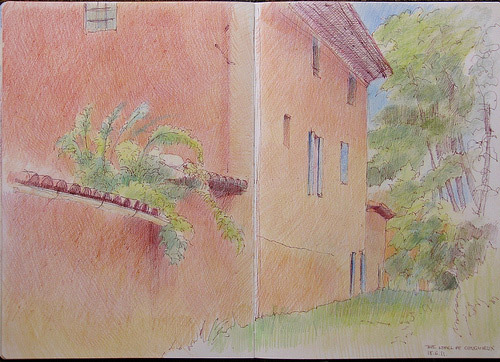 My quick sketch was done while sat on the bank next to the park in the shade from the midday sun. There were, of course a grou of painters in the same location and it's a good one as it's out of the main flow of traffic but offers the shade which is so helpful in Meduterranean climes to being able to see what you're putting on your paper or support. The town dates back to at least the twelth century. It's situated on five of the seven branches of the River Sorgue and is a mini Venice with lots of cafes and restaurants located next to the river. It's probably most famous for its Sunday market. 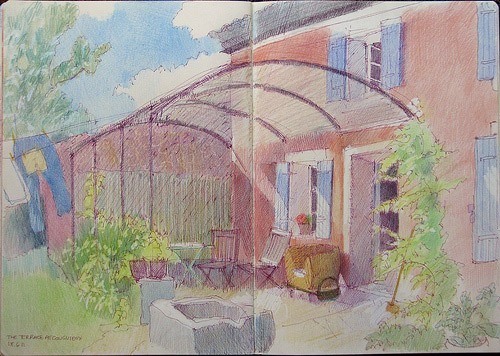 You've seen the view out from the terrace (in Breakfast sketch from the terrace and Sketching on the terrace at Couguieux) - and below you can see what it looks like when sat next to the road looking back at the area of the terrace and its immediate vicinity. We sit here in the morning drinking our cups of tea and coffee and gather again in the evening for our aperitifs - and mulling over what to do next. We had some cloud and rain here on Friday and Saturday. The wall was started while it was still cloudy while the ta-errace was sketched after the blue sky and sunshine returned on Saturday afternoon. Today it's very hot again - as we discovered on our walk to and from the local market! I am way behind getting sketches processed for this blog. 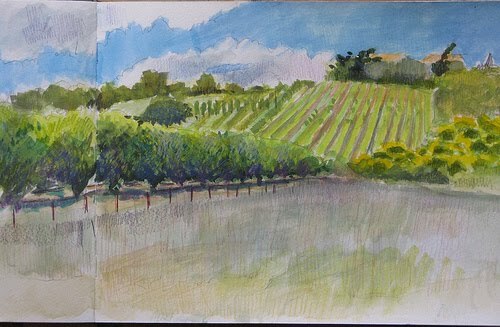 This is my morning painting of the vineyards and orchards which resulted - done in a Large Moleskine Watercolour Sketchbook. Do say which you prefer. 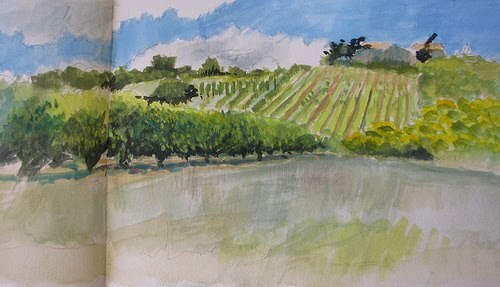 The purpose of painting in gouache is to limber up for learning how to paint in oils. However it also makes an excellent base for coloured pencils. The texture you get from using coloured pencils on top of NOT paper is of course also interesting. The view from the terrace at the Hotel Crillon Le Brave, a photo by makingamark2 on Flickr. This is the view from the terrace at the Hotel Crillon Le Brave. In the distance is Mont Ventoux and its incredible indigo violet blue slopes and the town of Bedoin. 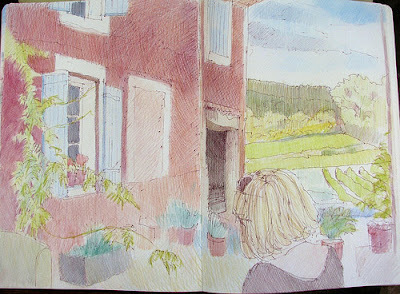 and sketching the view from my seat. At the end of the afternoon I ventured out into the sun and sat at the edge of the terrace and sketched the view of Mont Ventoux and Bedoin from Crillon Le Brave. Coming back to the house via Bedoin I ran into the most incredible holiday traffic (it was a French holiday weekend) an inched my way down the main street. I think there had been a major cycle race up Mont Ventoux. Menu du Terroir Champenois, a photo by makingamark2 on Flickr. I was due a treat as I was up at 5.30am to load the car, drive it to Folkestone, catch my Eurotunnel train and then drive across northern France. PS. written in the house in Provence. I've just worked out how to get photos from my iPad on to the blog (via Flickr). 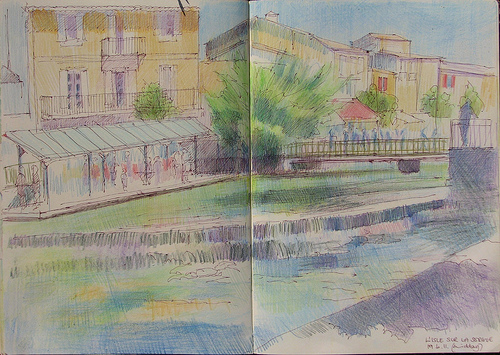 The sketchbooks are packed for Provence! 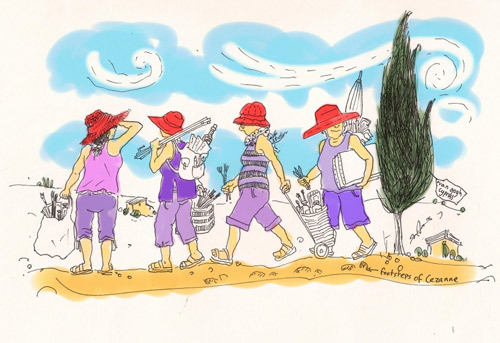 I am totally over provisioned with sketchbooks for my trip to Provence with three art blog buddies which you can follow on Four Go Painting in Provence. 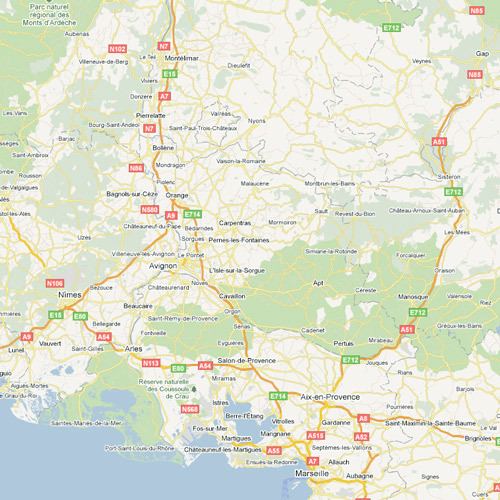 Below is a map of the places we can get to in the area where we are based in the Vaucluse. 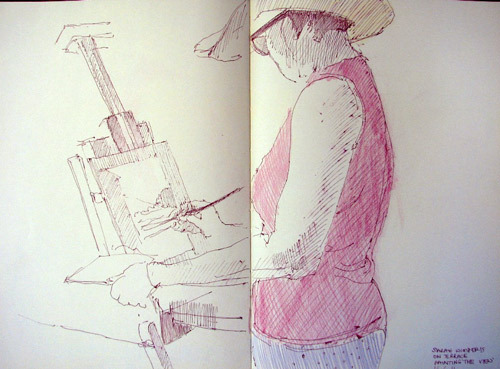 On the 1st June we went to the Royal Botanic Gardens, Kew for the day - and the sun shone. 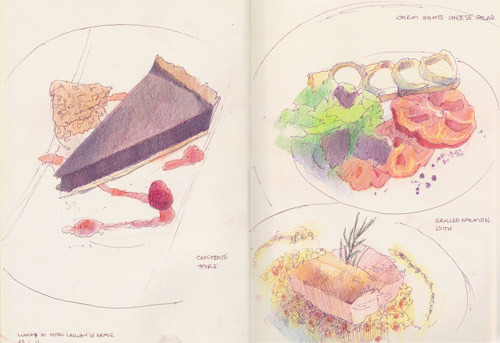 We followed our normal routine of walk and then sit - I sketch and "he who must not be bored while I sketch" reads his book and then walk and more sitting/sketching/reading. He's currently limbering up for retirement next month so was reading a detective novel rather than one of his heavyweight history biographies which are his normal fare. We sat on "our seat" next to the lake and were visited agin by "our goose" who is very cheeky. He's got looking at you with Big Eyes off pat. You know the look - the one that says "Surely you can spare just a little bit of that Taste the Difference Big Breakfast sandwich you've just bought at the Tescos outside the station" look. It's not so much I have a hard heart as I enjoy my Big Breakfast sandwich and he was about five minutes too late and all I had left was an empty carton and some apples. Anybody who wants to be overwhelmed by geese flying straight at them should bring bread to Kew Gardens. On the way home we saw a Mummy and Daddy Goose and a family of four little ones scampering (hurtling?) across the grass to a woman who was showing every sign of getting something out of a plastic bag to feed birds. The adults had to restrain themselves from taking off they were going so fast. 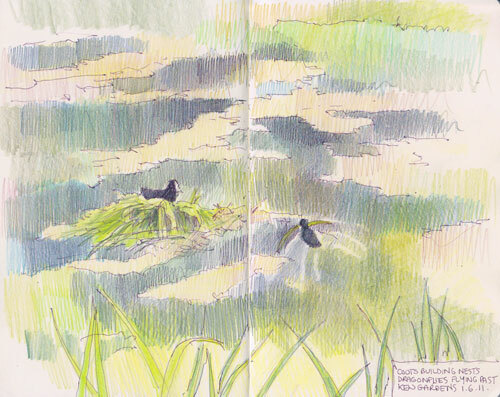 pen and sepia ink and coloured pencils in Moleskine sketchbook, 8" a 10"
My first sketch done next to the Lake was of a pair of Coots who were heavily into nest building. My attention was attracted by a weird tearing noise. I realised after a bit that the male coot was visiting the iris planted just next to where I sat and was tearing off leaves to act as nest material. He then swam very deliberately around the naples yellow weed patches to his mate who was sat on their nest resplendent in her new "just in" iris leaf finery. I assume she was hatching eggs as she was very loath to leave the nest - although I would have thought any babies would have been born long ago. Maybe they do year round hatching? The lake water was interesting to try and capture due to the many different colours of weed, submerged weed, reflections from the far bank and the inky darkness of the lake itself. 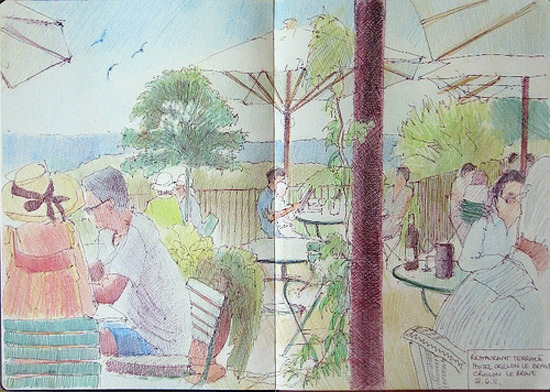 The next sketch - which I don't have time to scan right now - is a diptych of the view from the Thames of Syon house and the bend in the River Thames. It's been painted by quite a few artists and I want to take a look at the history of the view.